The Balangon banana has two faces. 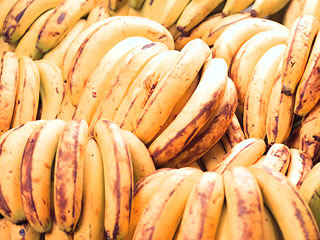 As a naturally grown banana, it can be enjoyed as a tasty and safe fruit. And as a commodity of "people-to-people trade," the banana helps farmers in the Philippines to become self-reliant. The Balangon banana was first imported to Japan in 1989 as a commodity of "people-to-people trade." This trade was launched when people in Negros, faced with hunger and struggling to attain a decent living for future generations, met with people in Japan who were concerned with "life, living and the environment." Those Japanese were seeking ways for producers and consumers, people in the South and the North, to live together. By eating the Balangon banana, we can support the livelihoods of the producers in the Philippines and help to create a better environment for living together on this planet. At present, Balangon bananas are grown in other parts of the Philippines besides Negros Island. Links of "people-to-people trade" of Balangon bananas are being developed by bringing producers in the South and consumers in the North closer to each other, based on "face-to-face relationships."